Dunes Golf Club – Hole #18 – A great finishing hole with a dramatic approach shot over the water. 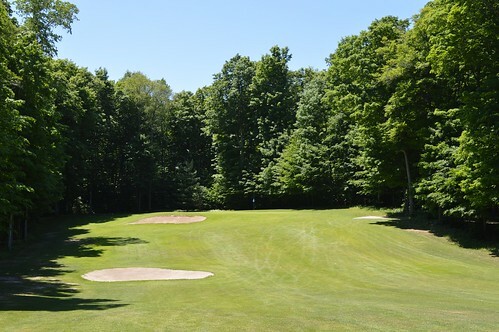 Although conveniently located on highway M-72, all but a few holes are isolated in the forest, and once you tee off you’re left with only the sounds of birds and wind in the trees. 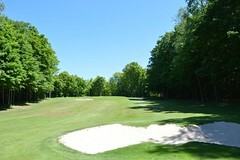 The fairway grass is lush, the rough is fair, and the greens roll smoothly and hold approach shots well. 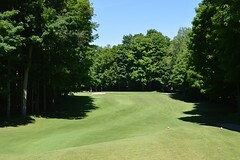 It’s a wonderful place to get away from it all and find that relaxing “zen” zone of golf. 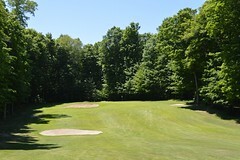 Chris’s father Dean Wall designed and built the course, opening the first nine in 1983 and the back nine in 1991. His mother Joy ran the clubhouse until retiring in 2013. The whole operation has a welcoming, friendly feel that is perfect for a vacation outing or an after-work twilight round. At 5,730 yards, there are some pretty short par 4’s and 5’s that can be real ego-boosters — but only if you keep it “down the middle.” The moderate length combined with tight fairways and dogleg angles make it a balanced and challenging experience. Bottom line: this is really fun golf course to play. Hole #8 – Longish par 3 with a receptive green. 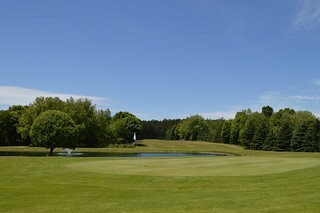 Hole #13 – Short par 4. Batman shaped bunker. A classic. Hole #15 – Final par 5 and it’s the shortest. For a hole-by-hole tour of the Dunes Golf Club, visit the Dunes Golf Club Photo Album and click on the photos for a slide-show view of each hole.